(Nanowerk News) A unique large-scale research device from Jülich went into operation in the USA yesterday. At the strongest neutron source in the world, the spallation source SNS in Oak Ridge, Tennessee, Forschungszentrum Jülich inaugurated a so-called neutron spin echo (NSE) spectrometer. The NSE spectrometer enables detailed observations to be made of the motion of proteins and polymers. It will thus help to develop improved plastics or to understand metabolic processes in cells. "Neutron scattering gives us unique insights into matter and is absolutely indispensable as a scientific method both for basic and also application-oriented research in materials science, medicine and biology," said Prof. Sebastian M. Schmidt, member of the Board of Directors of Forschungszentrum Jülich. "With our branch office at the SNS we are making the world's strongest pulsed spallation source accessible to German and European scientists." Forschungszentrum Jülich is the only research institution outside North America that has sole responsibility for operating its own instrument at SNS. "This is a visible sign that Jülich's long-standing expertise in the construction and operation of neutron instruments is recognized throughout the world," Schmidt added. The experience gained in the construction, operation and utilization of the NSE spectrometer will also be incorporated into the design and implementation of the European Spallation Source (ESS), for which concrete planning work will begin in January. Neutrons are the electrically neutral building blocks of atomic nuclei. They are generated in research reactors or spallation sources and in special devices, so-called "diffractometers" and "spectrometers", neutrons are guided onto the samples to be investigated. These neutron beams "bounce off" the atoms and molecules of the samples and in doing so they may change their direction and speed. The nature of this "scattering" provides information about the arrangement and motion of the atoms in the sample, which cannot be visualized by complementary methods such as X-rays or electron microscopes. Jülich scientists use neutrons to investigate, for example, magnetic materials for information technology or so-called soft matter, which includes industrially important plastics as well as proteins of interest to medicine. 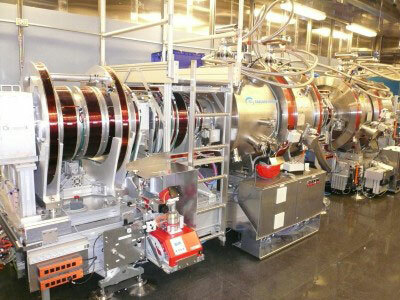 "This is the first time that an instrument of this type has been constructed at a neutron source such as SNS. The Jülich neutron spin echo spectrometer has the highest resolution in the world. We have developed innovative technologies especially for this purpose, such as superconducting coils with extremely homogeneous magnetic fields," said Prof. Dieter Richter from Forschungszentrum Jülich. Forschungszentrum Jülich is focusing its expertise in neutron research at the Jülich Centre for Neutron Science (JCNS) and maintains branch offices at Germany's strongest neutron source, FRM II, at Garching near Munich, as well as at the very high flux reactor in Grenoble, France, and now at the world's strongest neutron source, SNS at Oak Ridge, USA. Richter continued: "With the NSE spectrometer at SNS we will be able to observe the slow movements inside proteins that determine their function. Furthermore, we will be able to investigate the molecular redistributions in polymers which define their mechanical properties and their processibility." Funding for the device costing roughly € 15 million – designed and constructed by Jülich scientists – was provided by the German Federal Ministry of Education and Research and the Ministry of Innovation, Science, Research and Technology of the federal state of North Rhine-Westphalia. Yesterday, the device was officially inaugurated at the SNS as part of an international scientific workshop. The guests also included Dr. Beatrix Vierkorn-Rudolph, head of the Subsection for Large Facilities, Energy and Basic Research of the German Federal Ministry of Education and Research, and Dr. Steven Koonin, Under Secretary for Science of the US Department of Energy.